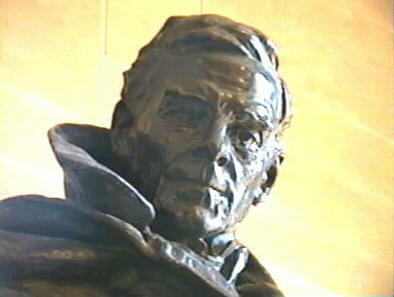 There are two main tributes to Richard Owen on the campus of Indiana University in Bloomington. One of these is Owen Hall, which presently houses the office of the University Chancellor. If you stand facing away from the rear of Owen Hall, you will see, nearby, the Tower Entrance to the Indiana Memorial Union. Upon opening the door to this entrance, you will see to your right a large indoor statue in memory of Colonel Richard Owen. Two images of the top of the statue are shown on this page. N. H. Winchell, "A Sketch of Richard Owen," The American Geologist, 6 (1890) 134-145. On reaching his home at New Harmony, Ind. [having been a professor of natural science at Nashville University, and having received in 1858 the M.D. degree from Nashville Medical College], he was immediately employed in the Indiana Geological Survey, and on the death of his brother, Dr. D. D. Owen in 1860, was appointed state geologist. He was still engaged on his [report of the state geological survey for the years 1859-1860, published in 1862] when he was offered by governonr O. P. Morton the Lt. [Colonelcy] of the 15th [Indiana Volunteers] and accepted; reading the proof of his report, in camp, May, 1861. After the battle of Greenbrier, [West Virginia], Dr. Owen was promoted colonel of the 60th [Indiana Volunteers] ... and remained with his regiment until Dec. 1863, participating in the capture of Vicksburg and Jackson, [Mississippi] and in the Red River campaign. He was with Gen. Reynolds at the battle of Rich mountain and participated in the defense of the camp at Huttonsville. In the same regiment were Dr. Owen's two sons, as subordinate officers. The winter of 1861-62 he guarded at Indianapolis 4,000 prisoners captured at Fort Donnelson. In the spring of the following year he was ordered to Kentucky, and his regiment was taken as prisoners of war by Gen. Bragg at Mumfordsville. Three months later they were exchanged. Although the regiment was paroled, Dr. Owen was not, nor were his side arms taken. On the contrary Gen. Buckner went out into the field where the regiment was guarded and thanked Col. Owen for the kindness to the 4,000 Fort Donnelson prisoners at camp Morton. ... After the exchange he was ordered to the southwest and participated in the capture of Arkansas Post. His regiment lost quite extensively in killed and wounded in this engagement. He was with Sherman in the first attempt on Vicksburg, and afterwards at the capture of the city by Grant, July 4, 1863. It was my aim to portray such a man as he might look while pondering over the meaning of the great struggle in which he was then taking part - his sympathetic heart touched by the suffering it caused, yet realizing its necessity . 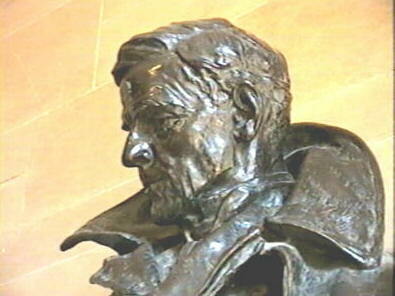 . . no work I have ever done gave me as much pleasure as the Owen bust.